"I am now here, personally encountering one of the footprints face to face and it feels good to see in person what is used to be a story that I only hear." It was a very spontaneous adventure. 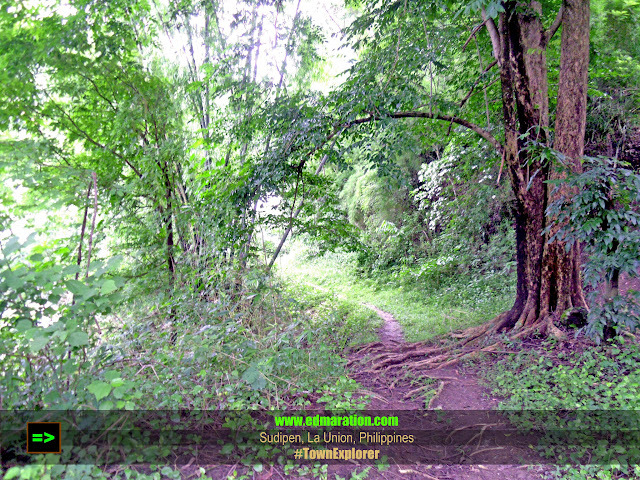 Being unfamiliar with the town of Sudipen in La Union, the things I discovered are surprising. The quiet town has no exceptional tourist attractions to offer but it offers a big cut of history and folklore. Sudipen is the home for the historical Intake Dam which was built by the Japanese during World War II and one of the footprints of Angalo, a mythical giant. Trekking the Amburayan River in Search for the Giant Footprint of Angalo. First, let's get familiar with Angalo. Angalo is a mythical giant hunter, and considered as a hero to some locals. The elders of the Ilocos Region believe that this giant once existed. As told by the Ilocano myth, Angalo was continually searching for his wife Aran thereby roaming around the whole Ilocos Region leaving giant footprints. In the Ilocano mythology, Angalo and Aran are believed to be the first couple to exist on Earth as in the case of Adam and Eve. For some, especially for those who are not familiar with Angalo, this adventure won't capture their taste. But as of me, I was very excited when I learned that one of the footprints of Angalo is located here when I went at the Town Hall of Sudipen to visit their tourism office. From different towns and different provinces up north, there are giant footprints and I promised myself to visit all these footprints and share it in this blog. To note, this is the first Angalo footprint I have discovered and I wonder how many footprints are there in all. Well, I think I have to explore more towns to document them. The trail for trekking has given me some refreshment. It was a good forest with springs at some rocks. Some of the giant rocks along the way emit cold fresh spring water. Thanks to a local resident who served as my guide. He was a tricycle driver and he unselfishly accompanied me to this area. The deal was 120 pesos as my fare. Not that bad. 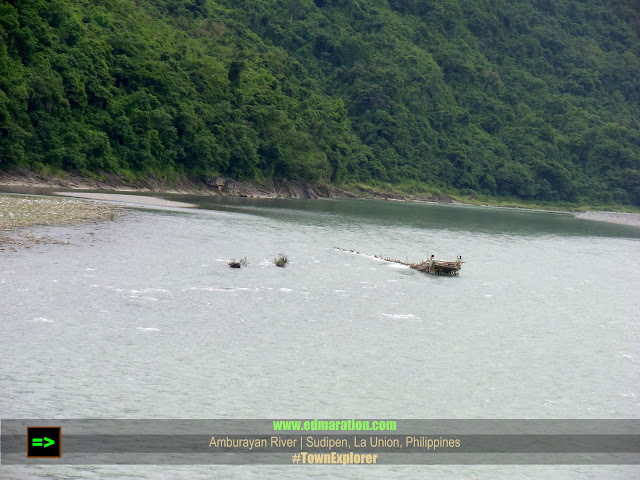 The trek is about 15-20 minutes and at some parts, it will offer you a view of the Amburayan River, a mighty river originating from Kapangan, Benguet that streams down to La Union and Ilocos Sur. Finally I have reached this part of the Amburayan River. It was a calm river, flowing in serenity with verdant mountains and hills nearby. A part of this river is a big rock which is believed by the locals to be one of the footprints of Angalo scattered to several towns up north. Notice the photo above. The huge stone is shaped like a footprint. The toes of the giant are also marked at the stone. I never thought that I will be able to see this in the town of Sudipen. It makes me love the Ilocano mythology more because now it is more than just hearing the stories from the elders. I am now here investigating about this mythology. Now I am not just learning about this myth through the stories passed from generation to generation because I am now here, personally encountering one of the footprints face to face and it feels good to see in person what is used to be a story that I only hear. More footprints to see and I am loving chasing after these landmarks of the Ilocano myth. 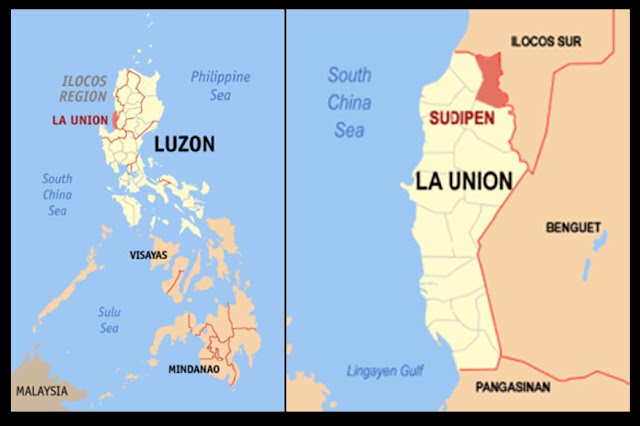 Map of Sudipen, La Union courtesy of Wikipedia. it looks like a fun hiking adventure filled with history and good exercise. the Survivor reality show should use this location for one of its future seasons. There are really beautiful places for explorers and adventurers like you! I believed in folklore when I was younger, well, I think most of us did. But of course, it's another story now that I'm (a little) older. Still, it's good to hear town stories. Btw, you had a good deal with the tricycle driver. What a nice myth story they have. Love the place though I haven't been there. But who knows someday I can actually see the other footprints of Angalo. @Juanderfulpinoy: This is just one of the footprints. The most famous one is located in San Quintin town in Abra, on which I tried to see. It was carved on a mountain and you have to ride on a bangka. Sadly di na ako nakalapit kasi wala pwedeng masakyan na bangka pero tanaw mo na yung Bundok. Several towns up north do have this geological feature either as a lake, or on the soil, mountain and rocks. 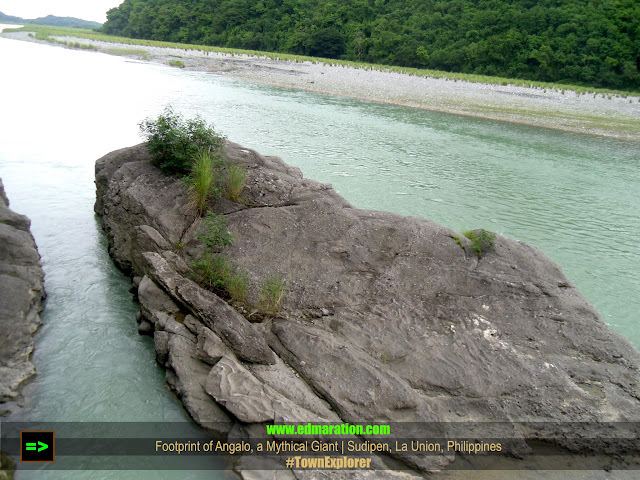 The other famous one is located in Pinsal Falls, the largest Falls in Ilocos. There are ample of them and I wanna see them all! It is a huge rock, if you notice it, parang inapakan siya ng higante. Sagada, yay! Oo ba, Di ko uurungan yan, pero baka next year na ako pwede, puno na ang last quarte ko ng sked eh, hehe.. The presence of these geological features up north makes the elder believe that a giant once existed here. I hope when you finally see the last of Angalo's footsteps that it would lead you to a great treasure. Great story on the myth of Angalo and another town featured again. Looks so breathtaking. Do they offer guided tours here? Para ngang me footprint dun sa bato. Never heard of Angalo Myth, thanks for sharing it. La Union is an interesting place to visit. I love hikes! I appreciate the map you showed us. Cool! Adeline Yuboco | There is no guided tour here because this is not a major tourist attraction, I must say :) I had a guide, but it was more of a DIY thing and I just talked to that man randomly then he brought me there with his tricycle. But it would be a great place if you want something different aside from the common and popular places that people visit and you will appreciate it if you are well-versed about that myth of Angalo otherwise, it is just a huge rock at the river. Looks like a nice place to hike, very serene! Ok ba sha for leisure hiking? Now that's another place you've discovered and unraveled. Is the town near Bacnotan? markpogi | Yes, it is I think about 20-30 minutes away from Bacnotan. The last photo is really the ACTUAL footprint of ANGALO?? He's truly a HUGE giant!! This place is worth exploring. Such an enchanting destination! Yes there are more to stories to Angalo and Aran in Abra and Ilocos Sur. 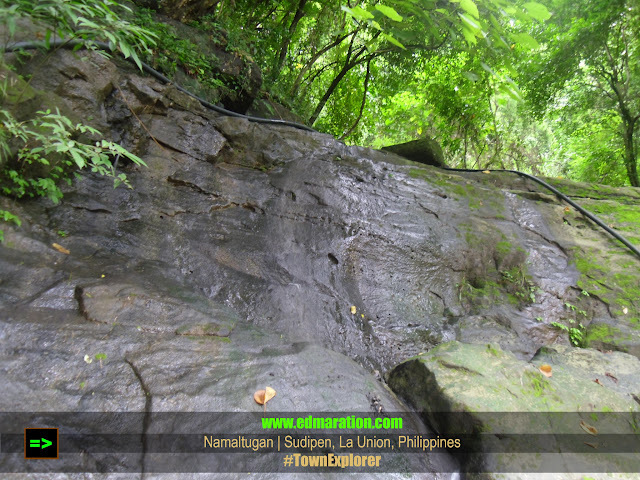 There's also their "bobon" or waterwell in Nanangduan, Pilar, Abra. Their bed in Nagcanasan, Pilar,Abra. You might further to explore.